Soap bubbles are one of the most interesting activities of childhood. Let’s make soap bubbles at home with the materials from the kitchen. You will learn how to make a soap bubbles solution and the wand to blow bubbles. Find out! How bubbles work and tips for long lasting bubbles. Pour 3 cups of clean water and a half cup of liquid dish soap into a container. Stir solution slowly to keep the foam from forming in the solution. Measure a ½ tablespoon of glycerin and add it to the container. Then, stir the solution again and place it aside. If you have any materials which have a circular hole in it, then it can be used as a bubble Otherwise, you can build one with a pipe cleaner or straw. To make the wand from straw, just bend its top tip into a circular shape, then fasten it with tape. Now it is time to blow some bubbles. Take your bubble wand and dip it into the solution and blow slowly in the hole. 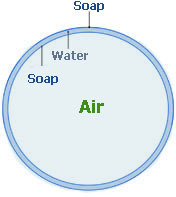 The boundary of the bubble solution is made of three thin layers of soap, water, and again soap. That means water is sandwiched between two layers of the soap. This boundary is called soap film. When water evaporates from layers of soap than the bubble pops. Glycerin is mixed with the solution to make layers of soap thick which keeps the water from evaporating quickly. In this way, bubbles become stronger and last longer. Try using different sizes of bubble wand to blow bubbles of different sizes. Add some drops of food coloring to the solution to make colorful bubbles. 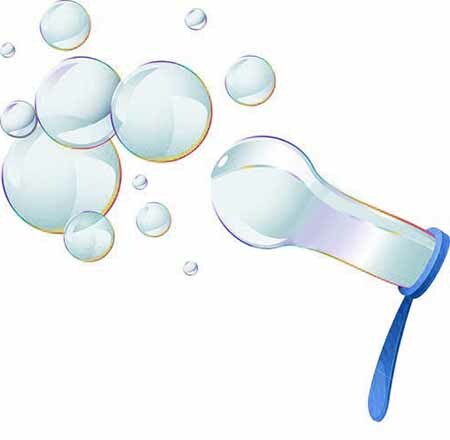 Abdul Wahab, "How to Make Soap Bubbles," in Science4Fun, April 13, 2019, http://science4fun.info/how-to-make-soap-bubbles/.